With this new slogan, Spartans for Safety is reminding everyone to be empowered bystanders. Two years ago on a warm May night, shots rang out in the Tenth Street Garage. Minutes later, police found three people dead: a man, his wife and her classmate. “That really brought home that no place is immune,” recalled SJSU Chief of Police Peter Decena. 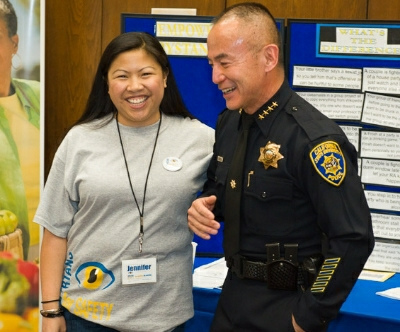 He was speaking March 14 at the Spartans for Safety launch party, where a coalition of several dozen stakeholders introduced a powerful slogan, video and website, funded in part by a Kaiser Permanente grant. The group — including staff members from the Student Health Center, Counseling Services, Student Involvement, Associated Students and more — is developing a consolidated violence prevention program paired with eye-catching outreach materials. “We want everyone to know that there are many of us on campus that care about the safety of all students, all faculty and all staff,” said Jennifer Gacutan-Galang, a staff member with the SJSU Wellness and Health Promotion office. At the launch party, the coalition unveiled sjsu.edu/spartansforsafety/, a one-stop shop offering practical information on a wide range of topics including domestic violence, healthy relationships and general safety. The exact same theme is at the center of a terrific student-produced video featuring people you know. Watch and you’ll hear campus leaders explain how 97 percent of rapists are men, 97 percent of men are not rapists, and 97 percent of sexual assault victims are female but there are many reasons why men should care.